Neil Young News: Neil Young's Ditch Trilogy -- Or is it a Quadrilogy? Or Quintology? 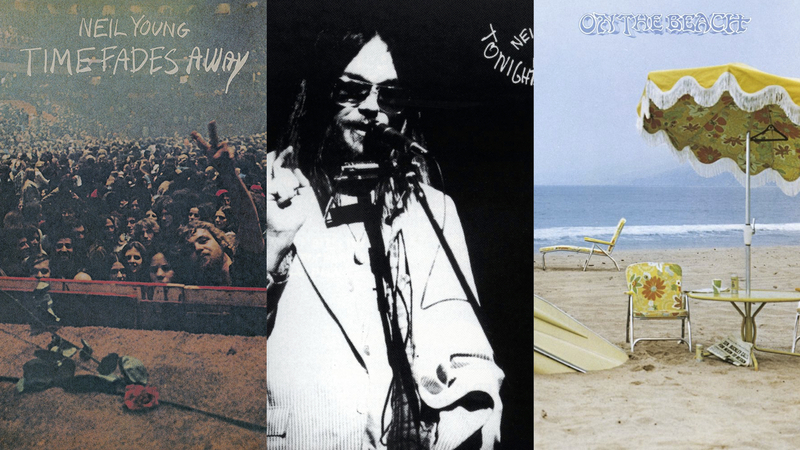 Neil Young's Ditch Trilogy -- Or is it a Quadrilogy? Or Quintology? "Time Fades Away", "Tonight’s the Night", "On the Beach" & "ZUMA"
Recently, we posted here on TW a post titled The Beautiful, Enduring Gloom of Neil Young's Ditch Trilogy, which generated some comments on whether this "trilogy" label is actually applicable. 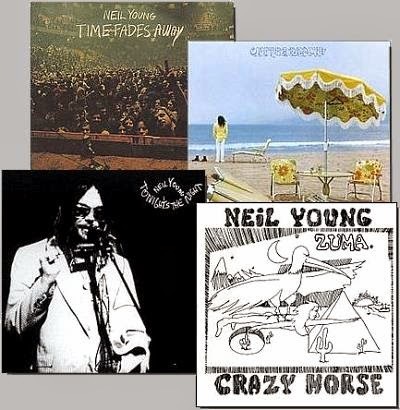 Neil Young's Ditch Trilogy -- consisting of "Time Fades Away", "Tonight’s the Night" & "On the Beach" -- is well documented as containing the "missing link" to the Rosetta Stone of understanding his entire body of work over the decades. In the often quoted hand written liner notes of Decade, Neil writes: " 'Heart of Gold' put me in the middle of the road. Traveling there soon became a bore so I headed for the ditch." Hence, the origin of the "Ditch" term -- which is sometimes also referred to as the "Doom" period or "The Wilderness Years". Some argue that there's no trilogy whatsoever and that the “ditch era was only made up of two albums; one jumping in, the other climbing out with "On the Beach" ". Others argue for the "Ditch Quadrilogy" to include "ZUMA". Yet others argue for the "Ditch Quintology" with "Harvest - Time Fades Away - Tonight's the Night - On the Beach - Zuma.....Harvest being the prologue that leads to the Ditch. And Zuma serves as the light at the end of the tunnel." As mentioned above, we have made our case before on Neil Young's Ditch Trilogy being the key to the Rosetta Stone of understanding his musical career. But we also expanded the argument last year Neil Young's "Ditch Quadrilogy" Re-Re-Release is Finally Coming! Official Release Series Discs 5-8 (4CD): May 12 Release. Lastly (but not really), an intriguing comment by kahunasunset who suggests that once Homegrown is released, maybe it'll really be a "Ditch Sextology"?! "Time Fades Away", "Tonight’s the Night" & "On the Beach"
"Though my problems are meaningless, that don't make them go away." I'll try to keep this brief. Just for context, I'm in my mid-40s and first got into Neil upon the release of Freedom back in the Reagan years. It didn't take me long to want to absorb and explore as much of this artist's music as I could find. This is all pre-Internet, mind you. The liner notes included in several of the original compact disc releases of a few albums (Live Rust, Rust Never Sleeps, and Comes a Time) referenced albums I'd never heard of. Specifically, Time Fades Away, Journey Through The Past, and On The Beach. I'd also heard the bootleg of the 1971 BBC performance and the 1974 Bottom Line show. Once I actually was able to find the records (which was a whole other pre-Internet pre-eBay quest), the pieces started to fit together. My rationale for the quintology originated out of a timeline. The songs JTTP, The Bridge, and Love in Mind were all debuted pre-Harvest. Those are key tracks on TFA. Likewise, See The Sky About to Rain, which didn't appear until OTB, was part of the 1971 tour. I'm not a psychologist, but for me, this dense chapter has an arc or thread that runs through it, from Harvest to Zuma. Not to mention that on several of the Harvest songs, the TFA band is accompanying him. So, there is a natural path from Harvest to TFA. Likewise, the ragged edges of TFA were the direct link to TTN, and everything that comes with it. I've always viewed OTB is sort of the climax of darkness, and Zuma, which still has its "bummers", as the happy ending, so to speak. Yes, Homegrown is in there somewhere, but since no track listing is available and at least one track (Pardon My Heart) on Zuma was possibly intended for Homegrown, we can only work with what we know. I love these albums as individual pieces, but really love them as a 5-record suite. As much as I enjoy the discussion about these albums, my proposal of adding Zuma to the trilogy, was because I believe 5-8 were created from a pure, unassuming place. Neil exposed his most inner emotions, musically and lyrically. There was no motivation to make a hit, impress anyone, preach or pontificate. He was being an artist in it's truest sense. Trying not to be too negative, we haven't seen that for many years. I enjoy no musician's body of work more than Neil's, but I can't help but be disturbed by the long stretch of, what I believe to be, drastically inferior projects. Having said that, I think you can only include 5-8 if you consider the "ditch" an emotionally introspective period. On a basically completely unrelated topic, I just got the Apple HomePod speaker linked with Apple Music. Neil has always spoken to me like no other artist has, but it's simply overwhelming when I tune out everything else and just listen to his music spanning the decades. Oh, sort of getting back to the subject of this thread, I'm now roughly 100 minutes into my one man Neil mini-marathon listening party, and I still haven't heard a song from the trilogy. Actually, believe it or not, not one song from Harvest either (yet). Neil's catalogue is breathtaking, whether or not you value anything he's done since the 70s. By the way, SIRI seems to like Freedom and Harvest Moon as much as After the Goldrush! PS: Gotta go now, Cinnamon Girl has gotten my attention. SIRI just got around to the Harvest album. It's all sounding so good, life really can be pretty easy and enjoyable at times. @ Bodhi - thanks for all of the background and context. Looks like a Comment of the Moment. We'll try and get that up soon. Working on a Valentine's day post for tomorrow. But thanks for the early valentine! As for the "Soldier" edits, Ask The Archivist! @ rightwing - Being an artist in the truest sense is one of the 1st things that comes to our minds when describing him. @ TopangaD - you've earned your right to go off topic here @ TW! Interesting on the SIRI playlists. Obviously, there must e some algorithm going on there but what the logic is, well who knows. It would be interesting to see if you recognize any patterns develop over time. Like is SIRI learning your prefs for acoustic or Crazy Horse, for example. Along the lines of off topic, don't you think once NYA goes wide open that there would be some interesting Jukebox possibilities for random playlists? https://m.youtube.com/watch?v=fHf66yqenjw. Nils Lofgren talking about ATGR, Amazing!!! !